Small people can beat big people. That’s what judo is about: exploiting the energy and power of the competitor to beat him. What judo is for martial arts, communicative leadership is in the world of business. Today trust in corporations, media and governments is low. Citizens, consumers, investors and employees are empowered by smartphones and social media – they can determine the fate of a corporation with a swipe on their screen. You can read how good or bad a leader you are in Kununu or Glassdoor. And the talents you want to recruit read it, too, alas. Customers share their experience with your company and you cannot do anything about it – other than changing your behaviour as a company and transforming every employee into an adult ambassador who listens to all stakeholders and enthuses them. This will lead you to being recognized for what you achieve by word of mouth of your stakeholders. Such recommendations make your company grow. Easily said. Earning the support of customers, investors, employees and society at large is the result of superior leadership that can be learnt. It is based on the ability of leaders to gain the acceptance of the stakeholders by making them part of your corporate narrative and behaviour. By making them understand, share, change and finally own your strategy. This is what “Communicative Leadership” is about. This is what the Listening Leader can deliver to a company’s success. Information is about re-establishing credibility and trust with stakeholders through superior information, based on facts, figures, timeliness, transparency and a good narrative. And, above all: address the “why” and the “how” you want to do things. Then a leader needs to really communicate. 2,500 years ago Zeno of Elea said that humans were created with two ears and one mouth, in order to listen twice as much as they speak. A superior leader has to learn to listen to his stakeholders and use what his customers, staff, investors and society tell him to improve his strategy. This listening has to happen 24/7. It has to be organized in order to allow the stakeholders’ input to change and fine-tune your strategy as a company. This continuous listening exercise, combined with Big Data and the development of markets allow a company to anticipate developments that can influence its destiny. Furthermore the leader has to enable his or her staff, making sure they understand their role in the big picture. Team members have to deeply understand the strategy and be able to see their role in successfully executing this strategy. A good leader has to know her own strengths and those of her team and deploy them to the benefit of the organization. Knowing what motivation is, namely mastery of a skill, autonomy in executing tasks and purpose of one’s work and employer, helps improve performance. Learning by doing comes first, complemented by mentoring and coaching and finally supported by traditional, academic education: this learning will enable employees to become more and more self-regulated and entrepreneurial. Then, The Listening Leader needs to let go of their power and redistribute it among their stakeholders. He or she will gain time to reflect and spend more time listening to their stakeholders and private environment. Empowering stakeholders strengthens resilience and the sustainability of a leader and their business. Last, but not least, the art of transformation management has to be learnt. All of this will strengthen leadership and ensure better engagement of the staff and more word of mouth recommendation of your company. And it is more fun. Because you work surrounded by professionals who perform better, not because they’ve been lured into a hamster wheel by a carrot or stick, but because they’re shaping the workplace, the products and services, the processes – and they’re owning them. You will leverage your people’s intrinsic motivation to make everyone achieve the black belt of excellence. 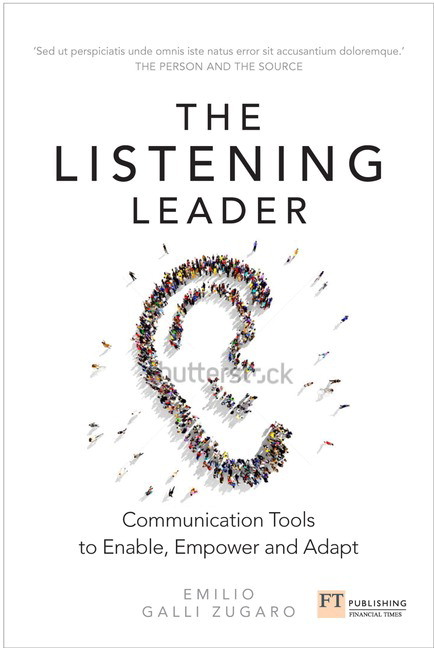 The Listening Leader by Emilio Galli Zugaro and Clementina Galli Zugaro is out now in paperback and ebook, priced at £24.99.